The LOVE YOUR STORY movement is about helping you to realize and take control of your life stories. This course will guide you through reframing your past stories so they no longer hold you back, but instead, you can find the meaning behind the experience. I congratulate you on the brave step to consider your past stories and to make them a foundation you can grow from rather than spaces of discomfort, shame, fear, avoidance, and sadness – for whatever reason. This course has 5 parts. It is set up with a podcast for you to listen to for each step. This is important because the detail in the audio discussion will help you to more fully understand the importance of that step. Listen completely and then move on to the assignment that is attached to each step. The course will guide you through each step with carefully crafted questions to help you consider and dig deep into changing and re-seeing your story. On the other side of this process you will find freedom. I have set this up so that you can do the work on your own – with a carefully chosen safe person – but if at any time you feel like you are getting stuck or want coaching through your process please feel free to contact me for personal coaching through this reframing process. 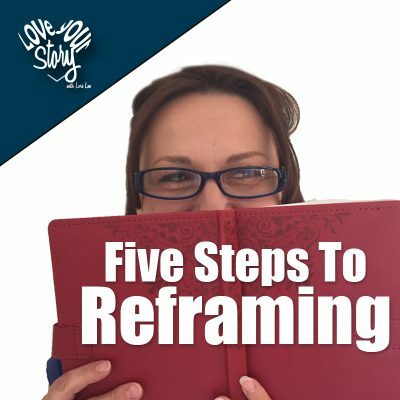 When I did the reframing of my own story I was not able to do it on my own. It took someone with a clearer head – someone who was not so entrenched in my pain – to point out the things I could not see. Don’t consider it a weakness if you find that it’s not a one-person job. CONGRATULATIONS on the having the wisdom and desire to reframe your sacred and tender places of learning and pain. NOW, GET STARTED!